I guess this part of my personality coincides with the part that gets into phases so easily. It can be food related (like, I totally ate a peanut butter and jelly sandwich twice a day for almost 3 weeks. I only stopped because my pants were getting tight across my booty) or it can be craft related. Right now I’m all up in loom knitting. 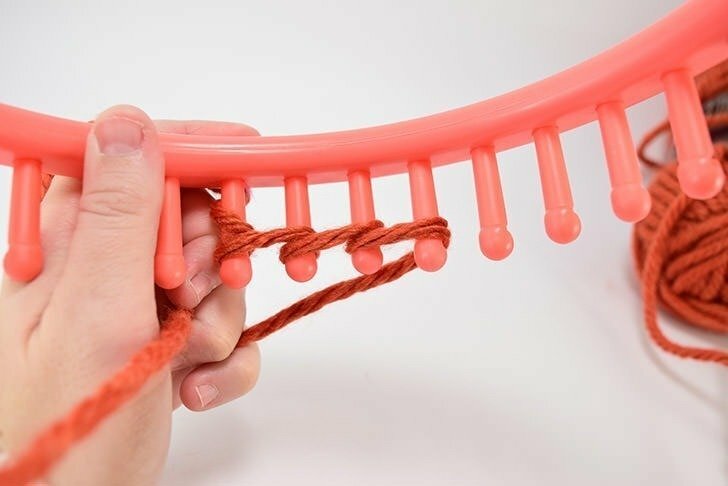 You see I’ve always wanted to knit. Desperately, really. I’ve tried books and videos and I’ve never been able to get beyond casting on. I had pretty much decided that I’m just a crochet girl and that’s okay, too. But out of the blue I got this set of round looms to knit on. To be honest I didn’t know much about them but I grabbed some Lion Brand Hometown USA bulky yarn and got to it. The next day I was up at the store stocking up on various colors of this fab yarn because I was hooked. I have to tell you that I have made a RIDICULOUS amount of hats and I’ve also got to tell you IT’S SO STINKING EASY! And last, but not least, they look properly knitted. 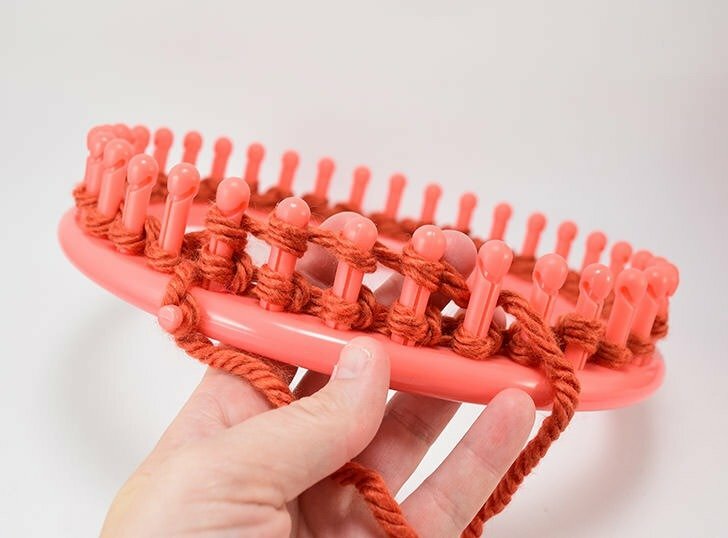 It’s not like a crochet stitch that can kind of pass for knitting, it’s properly knitting just in a different format. Seriously, y’all… since that very first cap I’m in love. 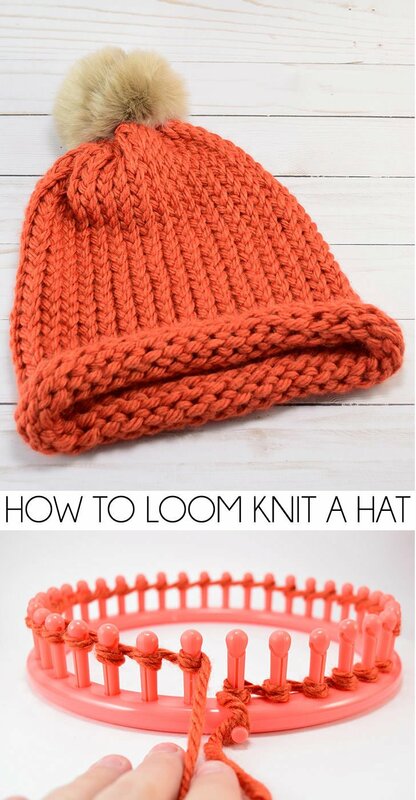 So today I’m going to show you how to loom knit a hat. 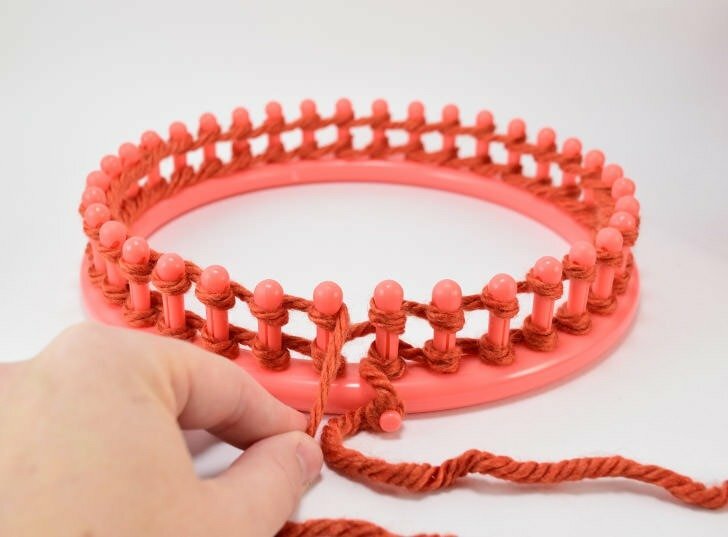 All you need is a large round loom and some bulky yarn. It’s so very simple that chances are your very first attempt will be perfectly wearable, too. Huzzah! Do you learn better with video? Do better with photographs? Let’s hit it. You can make an adult size hat using one skein of Hometown USA. This includes a pompom if you’re so inclined. This is the largest loom from my Boye loom kit and the loom hook that comes with it. To start tie an overhand knot onto the peg on the side of your loom. It doesn’t need to be crazy tight. This is just to keep our yarn from getting away from us as we start the looming process. You’re going to take the working yarn (the long bit as it comes out of your skein) to the right of the loom and wrap it around every peg in a clockwise fashion. Be sure to start with the peg just about your side peg. This will help with a visual cue to remember which peg is the first one. *sidenote: If left-handed you can work to the left and wrap in a counter-clockwise fashion. 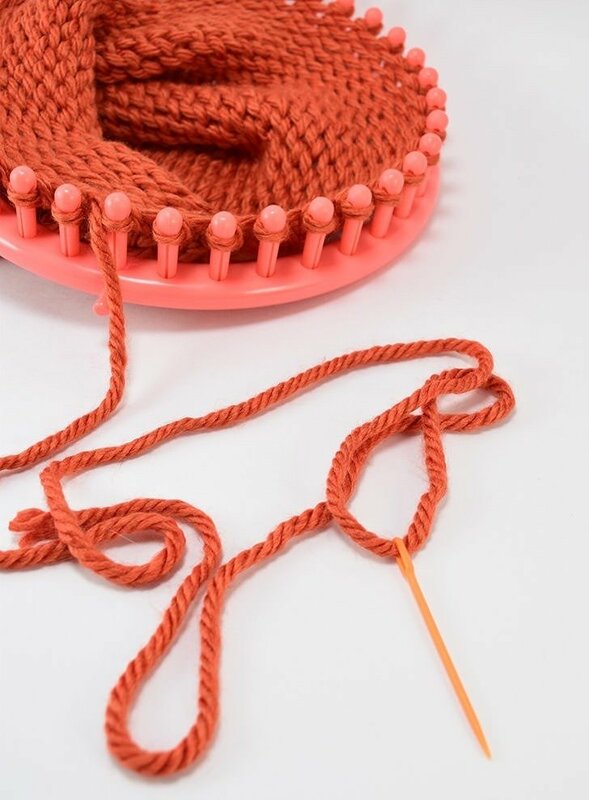 As you loop your yarn around each peg it is very, very important to keep the yarn nice and loose. Too tight and working the yarn later is a nightmare. Just keep it nice and loose as you go. 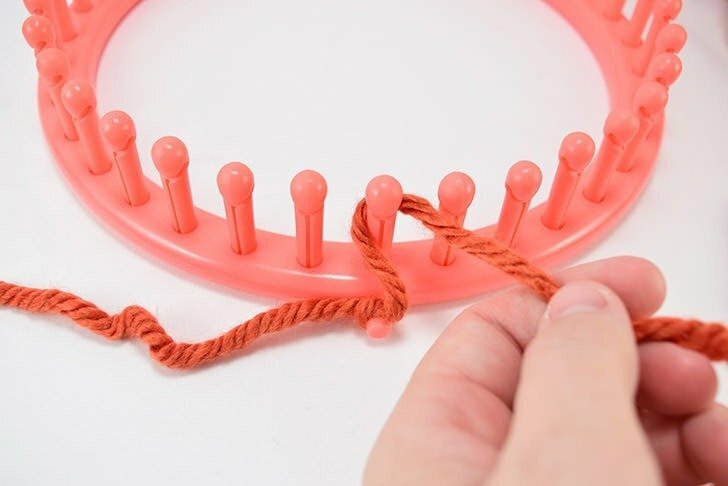 FYI – this is the E-wrap method, because you wrap the yarn around each peg in a lower-case “e” shape as it goes around each peg clock-wise. Now in case you’re one of those crafters where the more details you have about the process the better, this tip is for you :) This is the inside of my loom. This is how the yarn should look from the inside if it is properly wrapped. Wrap all of the way to the last peg. 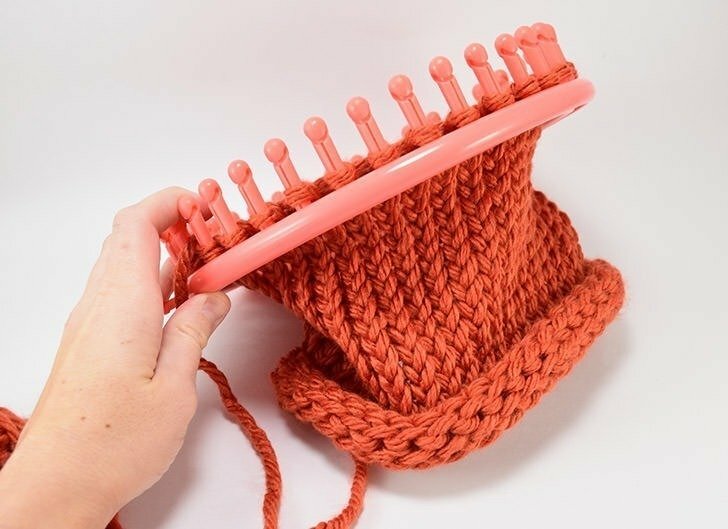 Holding on to your yarn so that it doesn’t get away from you, push the yarn down to the bottom of each peg, all of the way around. 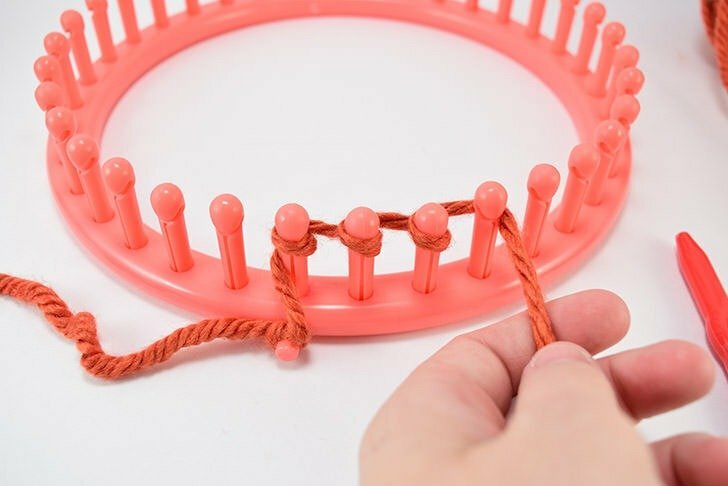 Wrap your yarn, loosely and counter-clockwise again around all of the pegs. 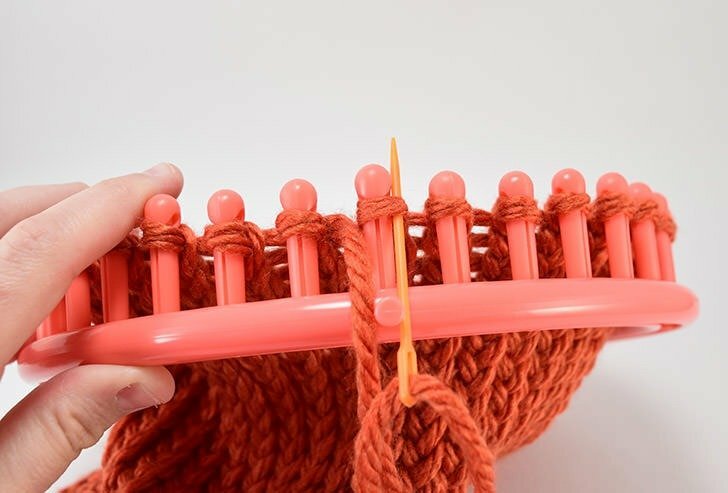 Hang onto that yarn because the moment you let go that yarn will unwind off of those pegs like the dickens! Using your loom hook grab the bottom loop on the LAST peg you wrapped. Pull that loop up and over the peg. Continue pulling the bottom loops over the pegs all of the way around. 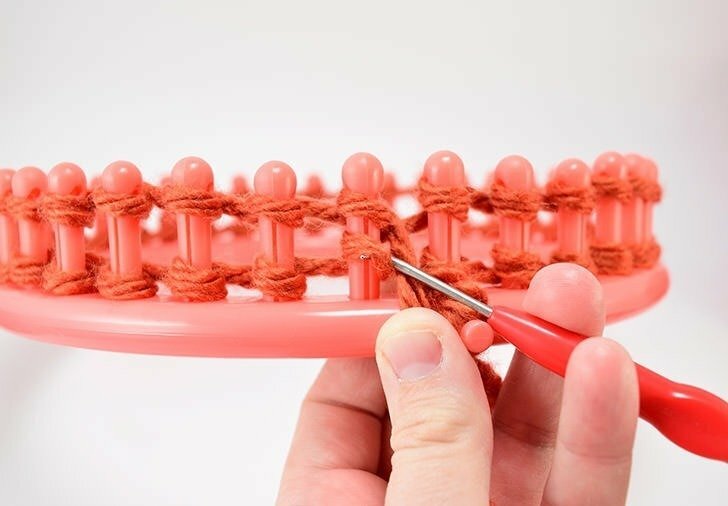 Push your yarn to the bottom of each peg, all of the way around. Continue the knitting process. 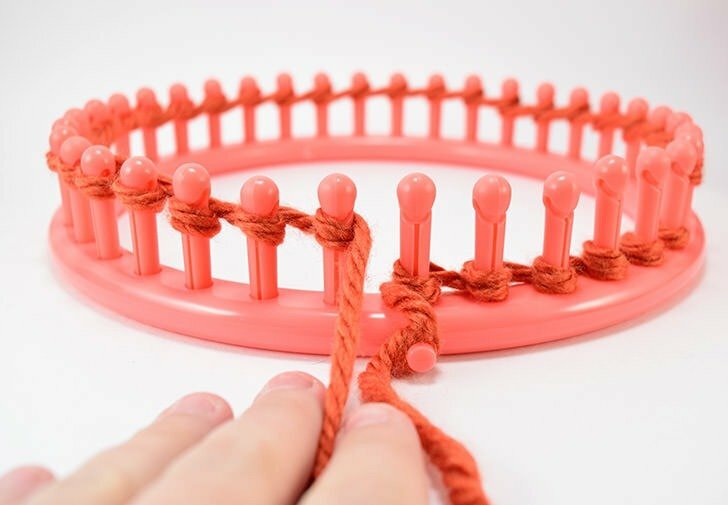 *Wrap the yarn clockwise, loosely around each peg. Starting with the last peg wrapped pull the bottom loop up and off of the peg. Continue around the loom. 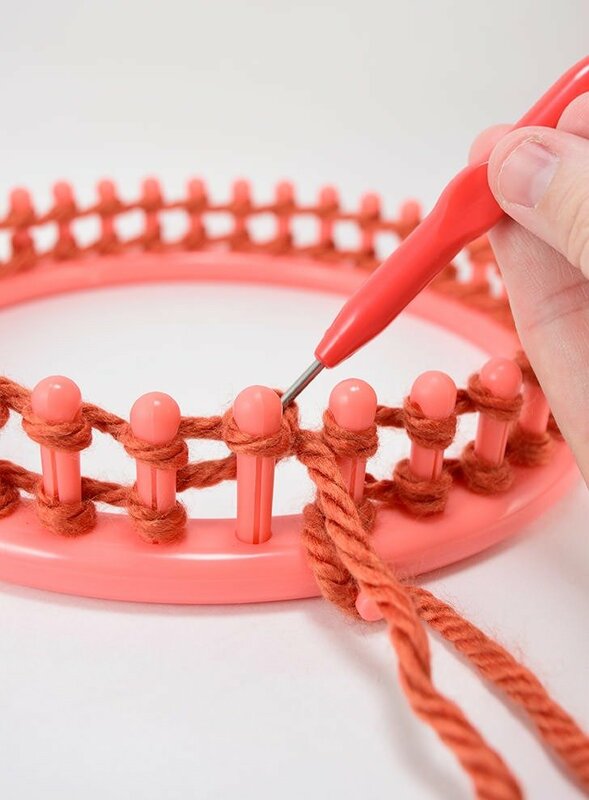 Push the yarn to the bottom of each peg. Repeat from *. Once you get a few rows of knitting done you’ll need to until the tail from the side peg. If you leave it it messes with the tension and your rows get all strange. 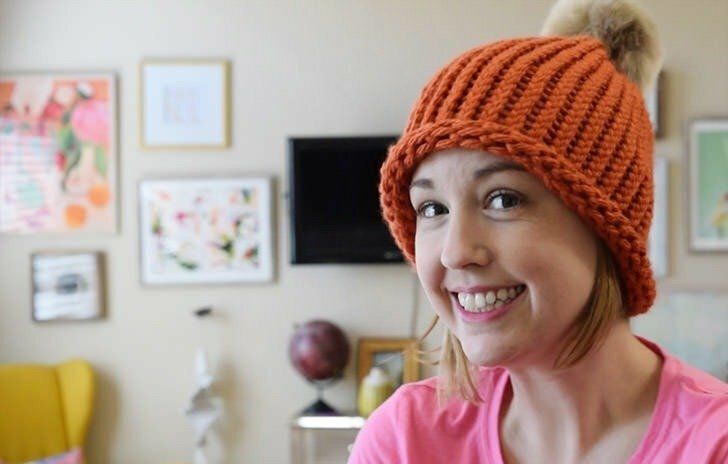 Knit around and around until you reach a length of 10 inches for a tighter fit knit hat. 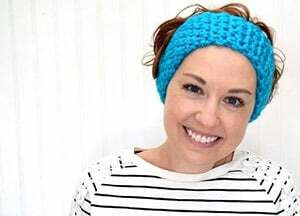 Add more length for a knit slouch beanie. 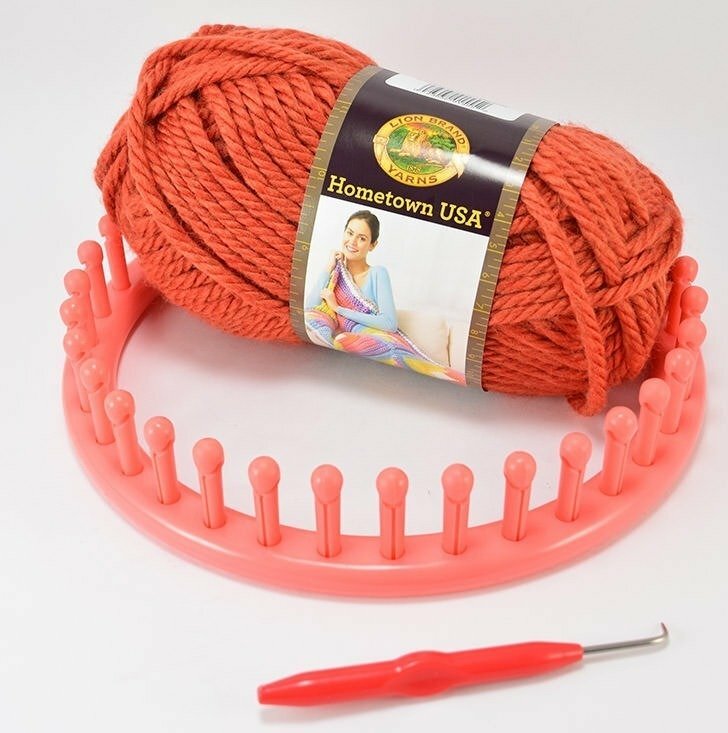 Cut your working yarn to 24-32 inches long and thread through a yarn needle (comes with your kit). Push your need up through every loop on every peg, starting with the first (just above the side peg) and all the way around. 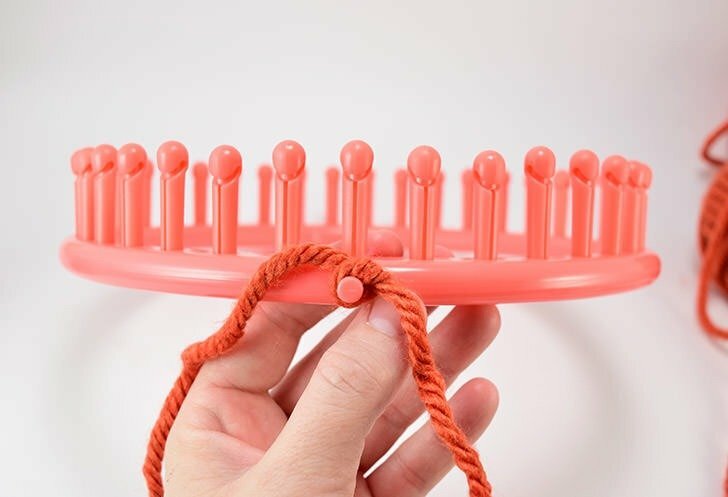 Once you’ve connected all of the loops on all of the pegs you can begin removing them with your loom hook. This is the knit piece as it looks straight off of the loom. 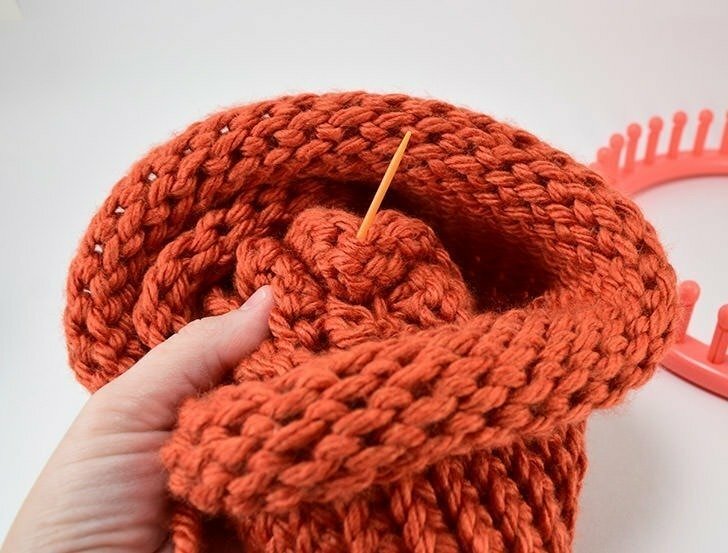 Pull the tail of the yarn tight to pucker the piece and form the top of the cap. Take care to pleat and tuck as you tighten to make sure the top looks neat. 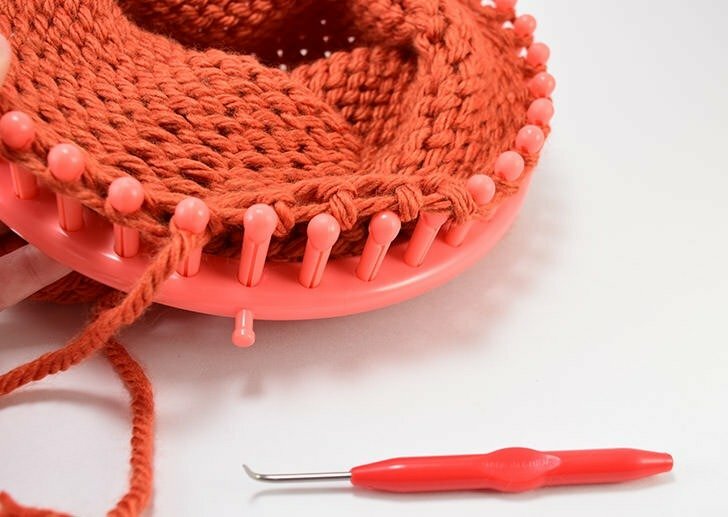 Make several stitches to keep the tightened area together. 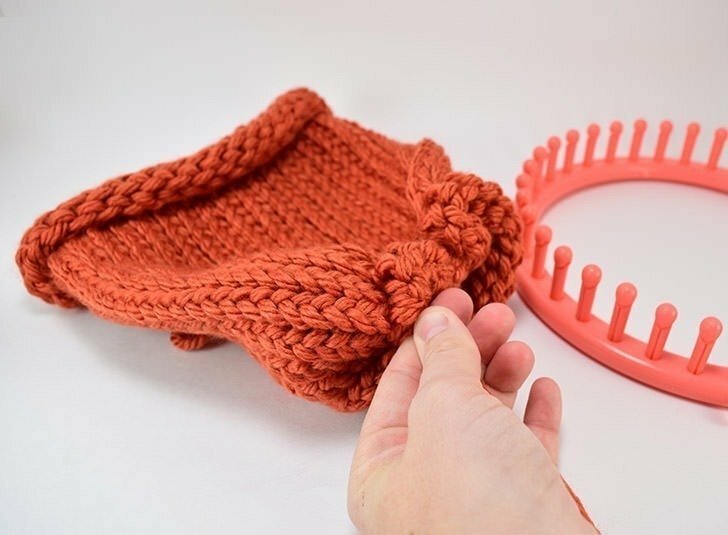 Finish by running your needle and yarn inside of the cap. Weave in the ends and trim the excess yarn away. 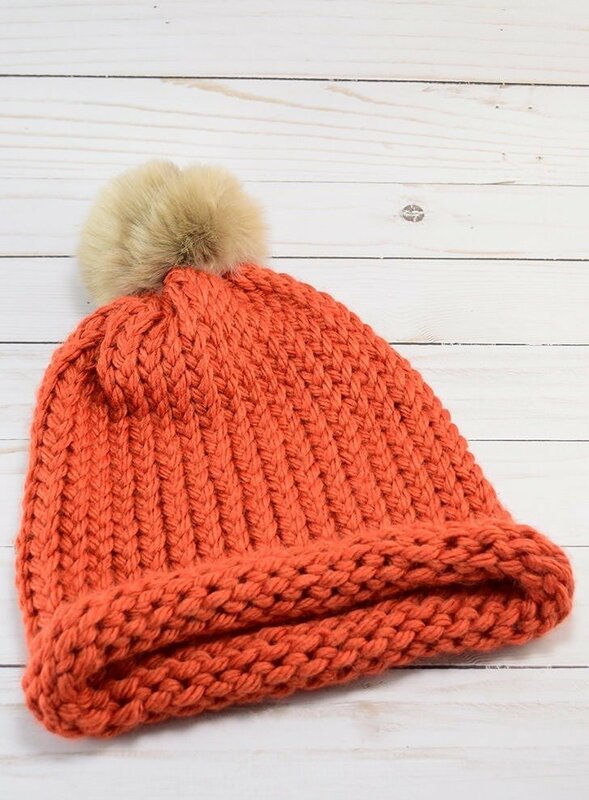 Add a pompom if you please. This is actually a faux fur pom I got on sale at Michael’s. Isn’t it fun? 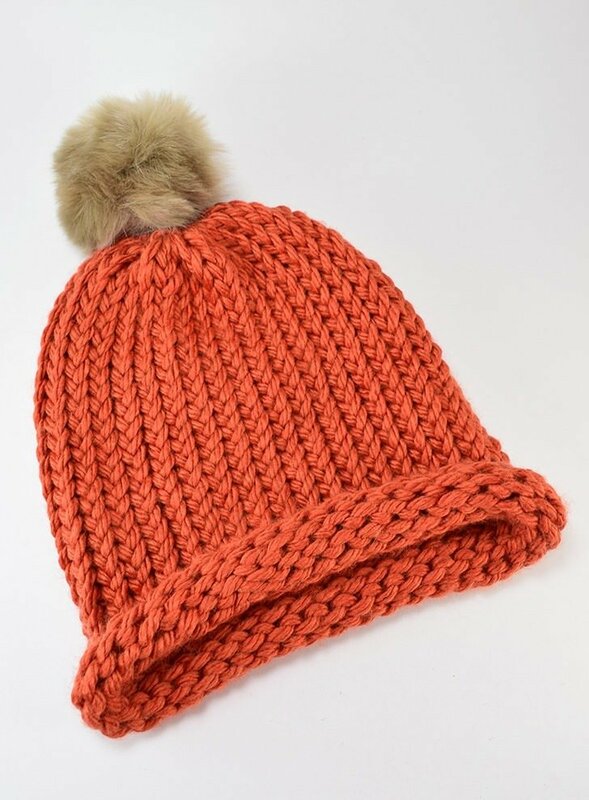 But a traditional pom pom looks fabulous also! 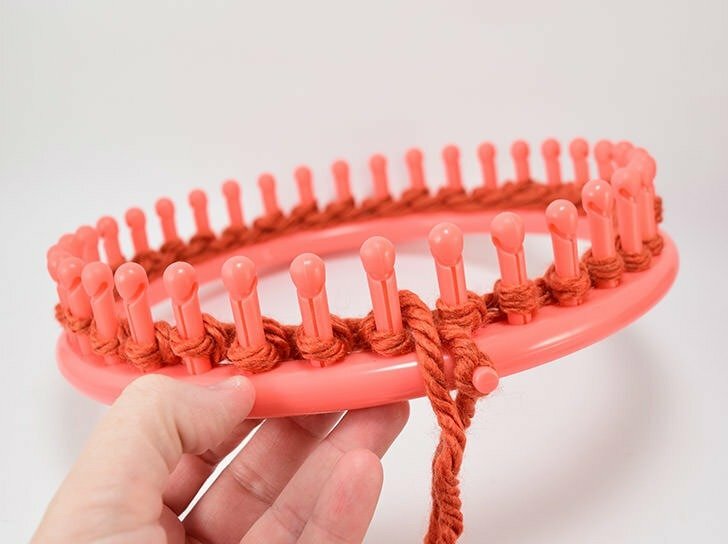 Learn how to make pompoms here! Now don’t you just love that? 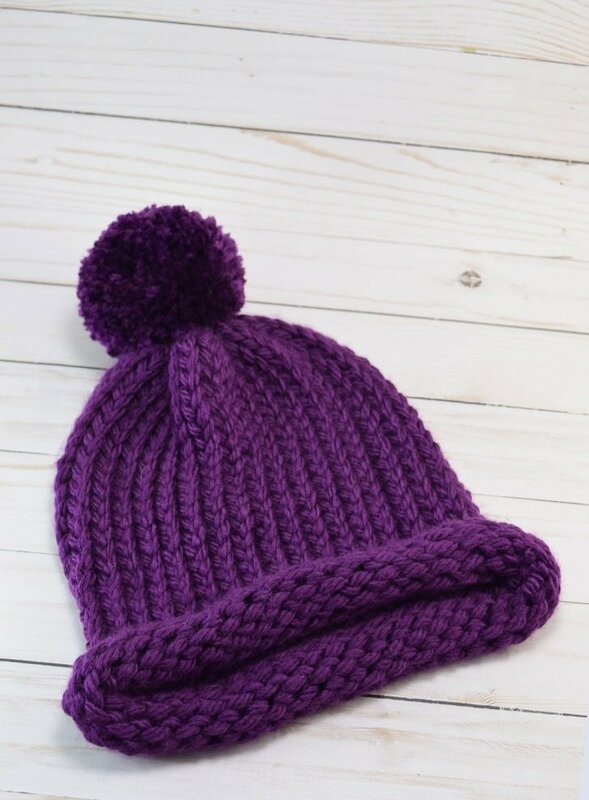 I’ve got a few more tutorials coming your way soon so that you can learn some variations on this really simple loom knit cap. I’m so excited! This craft phase is in full swing, my friends! 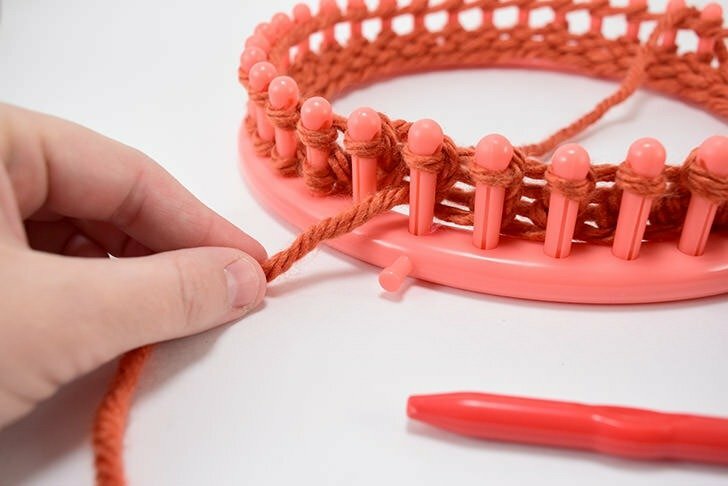 In fact, I’m checking out loom knitting patterns from other bloggers and I found a great resource for it… FaveCrafts. Have you heard of them? 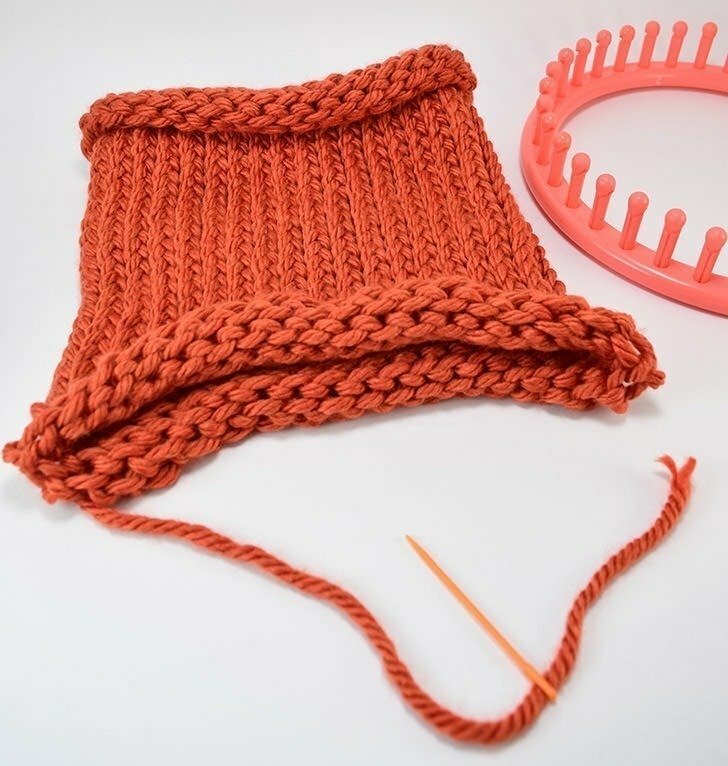 So get started and learn how to loom knit while making a simple but awesome e-wrap knit hat. I swear, you’re going to be addicted, too! Thank you that was easy to understand. Thank you for your explanation of the starting slip knot. I am just starting on my journey with looms and couldn’t find info on what to do with it! 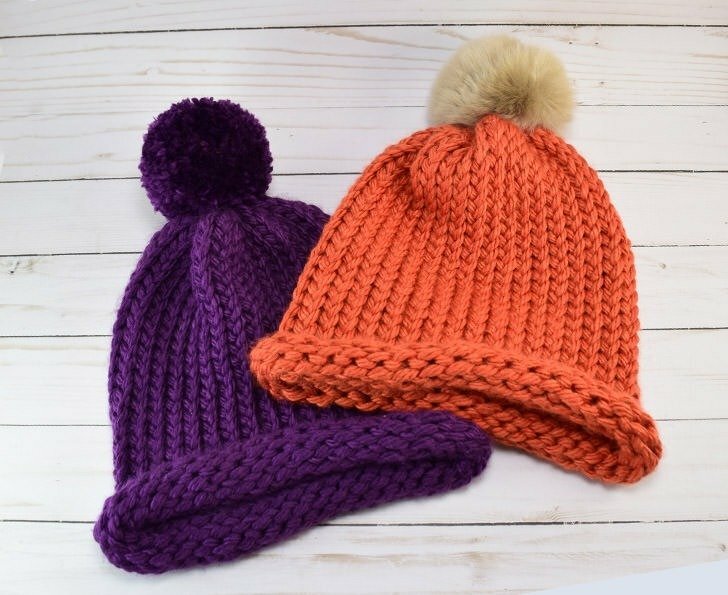 Love doing hats with the looms. 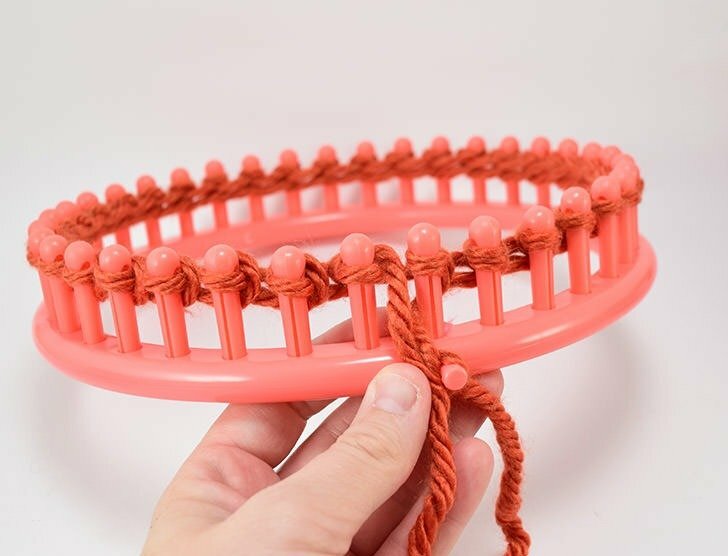 I want to know how long does it take to make a beanie on round loom? I can get one done in an evening, but I’d say 3-4 hours is probably typical. Oh, my goodness. It looks like spell-check did me in :) You’ll need to UNTIE the tail. 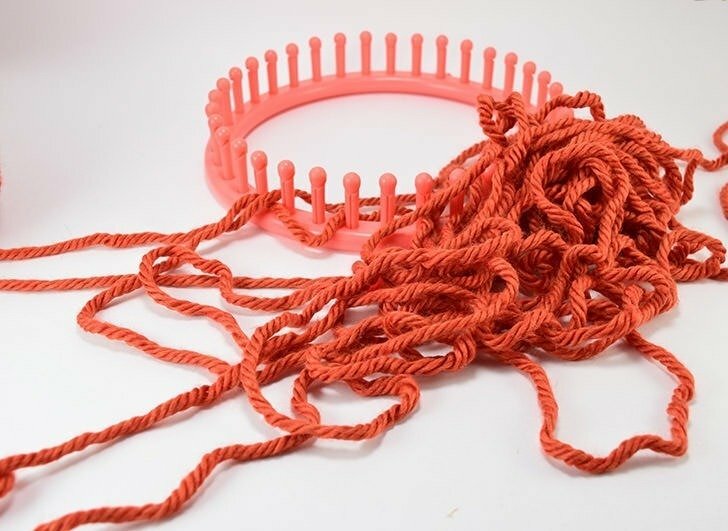 If you leave it tied on it will make the tension get tighter and tighter until it is difficult to work with. Best of luck! I could see little space between stitches, how to adjust it? 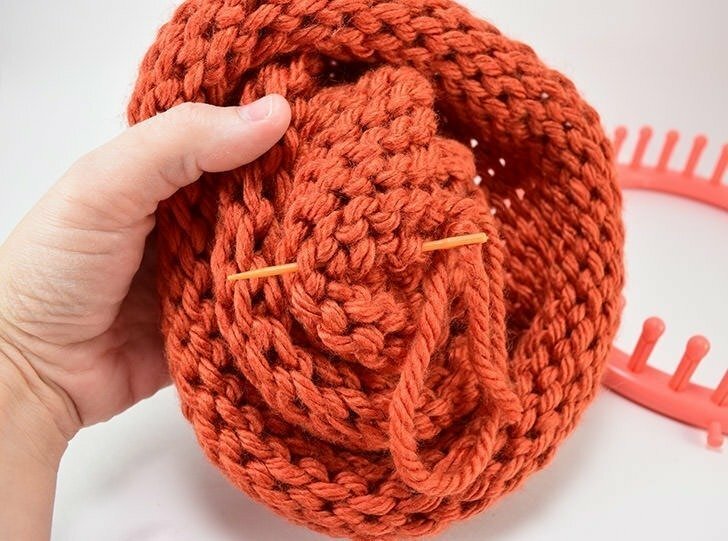 You can use a thicker yarn, that will fill up the space more!